High quality, industry standard size 9" by 11" sanding sheets for dry sanding, wet sanding, power tools and everything else! NEW! Multipurpose professional sandpaper. A heavyweight paper ideal for all types of surfaces. Long lasting aluminum oxide multipurpose sandpaper. Open coat system provides high cutting capability and lasts longer with less clogging. From 36 to 280 grit. SilverStar Silicon Carbide sandpaper sheets for dry sanding. From 80 to 320 grit. GoldStar Sandpaper offers the best value and premium performance. Coated to prevent clogging. From 40 to 600 grit. Platinum Sandpaper made with premium white aluminum oxide has surface treatment that resists clogging while dry sanding. Triple flexed for extra flexibility. From 40 to 600 grit. 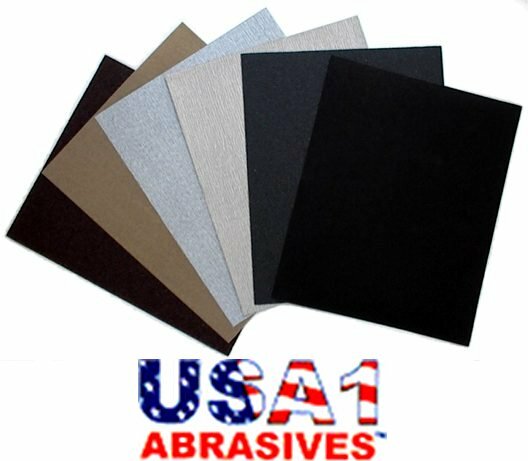 Premium wet/dry silicon carbide sandpaper for a superior quality finish. From P60 to P3000 grit. For wet, oil, or dry sanding. Used with water, it gives a very fine sanding of paint between coats. Also used with oil for smoothing and polishing metals. From 60 to 2500 grit. All purpose sandpaper for wood, metal, plastic, and fiberglass sanding and for removing old paint. Most common sandpaper used in wood working. From 36 to 320 grit. Heavy weight E paper backing is much sturdier than standard A,B,C, or D weight sandpaper. Resin bonded for extra strength. From 40 to 220 grit. Cloth backing offers flexibility and is suitable for heavy-duty applications, such as rust removal and metal shaping. From 40 to 400 grit. Flexible to fit contours and corners. Used for light rust removal and cleaning of metals. Fine Crocus cloth 9" by 11" sheet sandpaper used by mechanics or machinists for smoothing metal surfaces on shafts, bushings, etc. Flexible cloth backing. Designed for all types of bare wood sanding and finishing. Garnet abrasive fractures during use, continually forming new cutting edges. This sandpaper is the traditional choice of cabinet makers and woodworkers for producing smooth, fine finishes on bare wood. From 50 to 220 grit.